UCLA Bruins tight end Caleb Wilson (81) at California Memorial Stadium on Saturday, October 13, 2018. (Photo by Aaron Nelson / fi360 News). • Gaskin led the No. 16 Huskies to a 28-15 win over No. 7 Washington State Friday in Pullman, rushing for 170 yards and three touchdowns on 27 carries. • Gaskin, who finished his career with four wins and 10 touchdowns in four games vs. WSU, scored on two runs of five yards and another of 80, which proved the turning point of the game. • During Friday’s win, Gaskin also passed 1,000 yards for the season, making him the first Pac-12 player ever to rush for 1,000 yards in four straight seasons. He also moved past the 5,000 career yards milestone (5,131) and into third on the Pac-12’s career TDs list. Lastly, Gaskin also took over the third spot on the Pac-12 career rushing TDs list with 55. Also nominated: Eno Benjamin, RB, Arizona State; CJ Verdell, RB, Oregon; JJ Arcega-Whiteside, WR, Stanford; Wilton Speight, QB, UCLA; Jason Shelley, QB, Utah. • Davis had two interceptions for the first time in his career including one that he ran back 35 yards for a score on Colorado’s second drive of the game to key a 33-21 Cal victory. Davis returned his second interception in the second quarter 24 yards with the interception ending a Colorado drive at the Cal 21-yard line. • The pick-six was the first of his career and one of two interceptions the Golden Bears returned for touchdowns on each of Colorado’s first two drives to jump out to a 14-0 lead less than two minutes into the game. • Davis added three tackles, one pass break up, and also returned four kickoffs for 82 yards and finished with a game-high 141 all-purpose yards. • Davis now has four interceptions on the season and leads the Pac-12 while ranking tied for 14th nationally with an average of 0.36 interceptions per game. • Coutts pinned Colorado inside its own 20-yard line five times without a touchback on eight punts for 371 yards with all the numbers either setting or equaling his career highs at Cal. • Coutts also had two punts of 50-plus yards for the first time in his Cal career and finished with a 46.4 yard average and a net of 47.1. Cal recovered a pair of fumbles on his punts, while Colorado had another fumble for a no gain return and a negative return on another while totaling minus-six yards in punt returns. 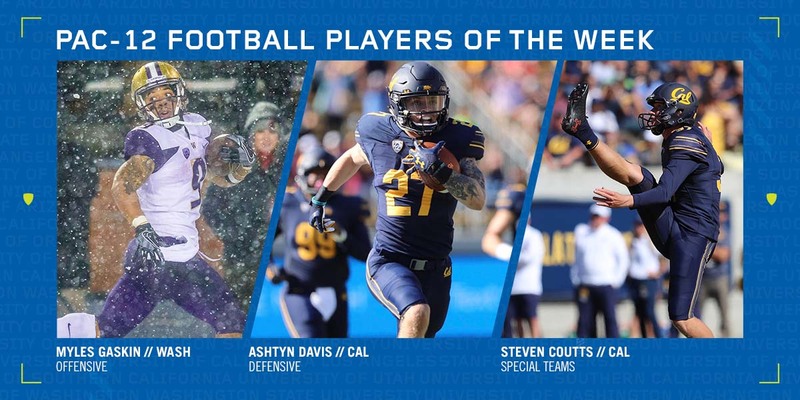 • Coutts also drew a key roughing the kicker penalty to extend a fourth-quarter drive that helped Cal hold on to its 33-21 lead that became the final score. • On the season, Coutts has pinned his opponents inside the 20-yard line on 30 of his 58 punts.